Chelsea boss Maurizio Sarri is reportedly eager to land two key January signings to bolster his defence and attack for the second half of the campaign. The Blues have started the season well as they sit just two points adrift of the Premier League leaders, while they’ve also made a strong start in the Europa League. 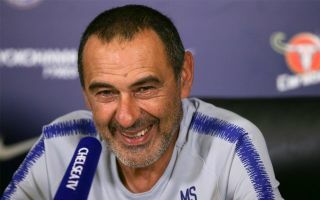 All that despite the fact that Sarri arrived late in the summer to take over from Antonio Conte, and yet the Italian tactician has successfully managed to get his ideas across quickly. That impressive early form could perhaps convince the Chelsea hierarchy to back him in January to allow him to stamp his mark on the squad further, with Calciomercato, via the paper edition of Corriere dello Sport, reporting that he wants Krzysztof Piatek and Daniele Rugani. The former has been a revelation in Italy so far this season, scoring 12 goals in seven games in all competitions. Coupled with the fact that both Alvaro Morata and Olivier Giroud continue to struggle to fire in the goals needed consistently, it may well be a sensible signing. Nevertheless, given the 23-year-old hasn’t proven himself at the highest level across an entire campaign yet, it could still be regarded as a gamble from Chelsea if they choose to spend big on him. As for Rugani, there is no doubt over his talent and promise moving forward, but with the likes of Leonardo Bonucci, Giorgio Chiellini and Mehdi Benatia battling for places in the Juventus backline and who are arguably ahead of him in the pecking order, it’s difficult to see him get the playing time that he desires. With that in mind, a switch to Chelsea to fit in alongside the likes of Antonio Rudiger and David Luiz as a long-term solution for Sarri and the Blues could be another astute addition. Time will tell though if Genoa or Juventus are willing to sell, with the Chelsea boss looking to sustain a title challenge in his first year in England.